Ashley obtained her B.Sc. and M.A. degrees in Psychology at York University. For her M.A., she examined whether monolinguals and bilinguals differed electrophysiologically in resolving lexical competition. 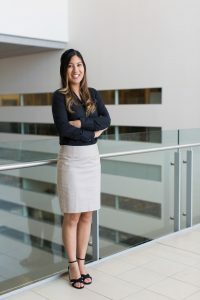 Her primary research area involves investigating the neural correlates of verbal and non-verbal control networks in bilinguals who code-switch frequently compared to those who switch less frequently. She is currently involved in several research projects that include examining the relationship between bilingualism and executive control in verbal and non-verbal tasks with ERPs.